Michigan's connection to nature is well-known to anyone who's been here any length of time. While there's a whole lot of nature to see at any given time in the state—the lakes alone are a big start, but there are mountains and plenty of other exciting things to see—there are certain points of Michigan's natural setting that are particularly unusual or otherwise impressive. So pack up your camera gear and prepare to check out 15 hidden gems that you won't see anywhere else but Michigan! A bit of a copout, because everyone knows about these magnificent lakes, but that's why it's leading off! You simply cannot talk about natural wonders in Michigan without talking about the Great Lakes that made it famous. Considering that these expanses of water represent about one gallon in every five of fresh surface water on the face of the Earth—that's before the issue of Michigan's water table, sometimes called the sixth Great Lake, comes up—it's hard to call these familiar forms anything but a natural wonder. The Great Lakes even had a hand in generating both the Upper Peninsula and Michigan's distinctive “mitten” shape that lets residents, to this day, use their hand as a map. Michigan has no real shortage of waterfalls, especially given that the state has no real shortage of water. Bond Falls, meanwhile, is a little something special. Part of its own state park of the same name, Bond Falls measures 50 feet-high, and 100 feet-wide, making it an impressive sight focused around falling water. Since it's part of a state park, as noted previously, there will be plenty of other, albeit lesser, natural wonders lurking around to enjoy. Every year, not too far from Escanaba, there's a part of the Great Lakes that serves as the highway for another natural wonder of Michigan: The annual migration of Monarch butterflies. Moving from the Northern climates down to the Sierra Madre Mountains, thousands of these butterflies take temporary refuge at the Peninsula Point Lighthouse. So if you've ever wanted to see huge amounts of butterflies in one place, Michigan is a great place to check it out. Not all of Michigan's natural wonders require huge land masses to contain them. The Petoskey Stone—commonly found around Petoskey—is an unusual breed of mineral that's actually not all rock. It's also at least part fossil. The fossil of rugose coral, it's actually created as a result of glacier activity. Petoskey Stones, commonly found in the northernmost parts of Michigan, are also known to be found near complete colonies of fossilized coral. 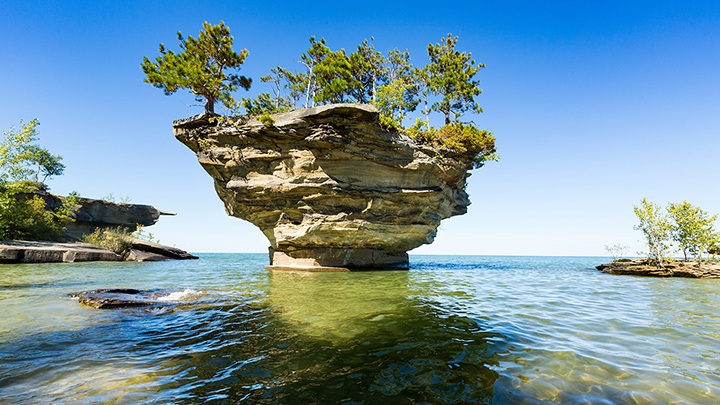 The massive, unusual granite formation that is Turnip Rock, near Port Austin, is named for its rocky composition and its overall appearance, which is very similar to a turnip. Narrow at the bottom and expanded at the top, Turnip Rock is a massive and impressive sight, but you'll only be able to get close around the bottom as getting onto Turnip Rock is a forbidden activity. Still, canoers, kayakers and swimmers won't have a problem getting up close and personal with Turnip Rock. Not far from the towns of Paradise and Timberlost lies Tahquamenon Falls, one of Michigan's greatest natural wonders. With over 50,000 gallons of water going over the falls every second, it's actually one of the largest waterfalls east of the Mississippi River. That puts it on par with names like Niagara—both American and Bridal Veil falls fire off around 75,750 gallons per second—and offers an amazing view of a chunk of Michigan history. Turns out the falls had a major role in Michigan's timber industry, so for a natural and historical wonder, check out Tahquamenon Falls. Not the only sand dune-related entry on our list, but still a point worth checking out, Silver Lake Sand Dunes near Hart actually manages to look like a desert. That may unnerve some people—the idea of a state so water-rich as Michigan containing a desert is preposterous—but given that it's a combination of forest and sand stretching over 2,000 acres, it's still a point that needs to be seen to be believed. It's regarded as some of the most scenic footage in Michigan, and with good reason. The Copper Harbor area—near the resort town of the same name—features a variety of picturesque landscapes ranging from woods to coves and all expanding outward onto the larger vista of Lake Superior. It's been said that sunsets in the Copper Harbor area are especially noteworthy. It doesn't happen often in Michigan, but those who pay particular attention to certain meteorological conditions will note that, on rare occasions, Michigan gets access to one of the greatest light shows nature has ever minted: The Northern Lights. Generally better viewed the farther north you go—and Michigan goes pretty far north in its northernmost extremes—sometimes the Northern Lights have dipped as far south as Traverse City, leading to some truly impressive photos like one taken last Labor Day of the Mackinac Bridge surrounded by the phenomenon. For anyone who's been on a Michigan color tour, you know firsthand what a natural wonder this can be. All over the state, commonly running from potentially late September to early October depending on weather conditions, the massive amount of trees in the state change from a blanket of nigh-universal green to a riot of reds, yellows, browns and greens, and plenty of mixes in between. Color tours can be found most anywhere in Michigan there are trees, so wherever you are in October, you'll be able to see at least some color in play. Want to check out some huge trees? Don't think California redwood, think Michigan cedar. On South Manitou Island, the Valley of the Giants contains a massive, old-growth forest of white cedar. How old is that old growth? Try over 500 years. One naturally fallen cedar boasted rings sufficient to date it at 528. If you want to see trees that were antique when America itself was young, head out to Valley of the Giants. Michigan owes a lot of its heritage to its Native American population. Even the word Michigan itself descends from the Ojibwa “mishigamaa”, or “large lake.” For an example of what those Ojibwa might have meant by mishigamaa, check out Kitch-iti-Kipi—or “big cold water,” as reports suggest—near Manistique. The largest freshwater spring in Michigan, Kitch-iti-Kipi generates 10,000 gallons of water every minute to fill a spring 175 feet-wide, 40 feet-deep, and at a constant temperature of 45 degrees. Found on Mackinac Island, Arch Rock is pretty much what the name suggests: A big arch of rock. Put more exactly, Arch Rock is a natural arch of solid limestone created by natural erosion. Standing fully 146 feet over Lake Huron, Arch Rock represents one of Michigan's great natural wonders. Check out the nearby road and bicycle trail for different perspectives on this one. Thirty-five miles of hilly sand may sound like a big cat box to many, but that's also a worthwhile description of Sleeping Bear Dunes. Visible from outer space, this massive conglomeration of sand dunes near Empire is one of Michigan's leading parks with a lot of exciting things to see and do therein. Throw in the fact that a USA Today poll back in 2014 gave Sleeping Bear the nod as the most beautiful place in Michigan and the end result pretty much speaks for itself. Not far from Munising, and part of a 73,000-acre park, lies a chunk of natural history that makes even the Valley of the Giants look like a babe in cradle by comparison. Pictured Rocks National Lakeshore, as it's known, offers a series of sandstone cliffs amazing to behold, containing sandstone that's said to be a whopping 500 million years-old. Throw in a series of dunes, waterfalls, and forests alongside the rocks and Pictured Rocks will deliver an awe-inspiring natural beauty surpassed by precious little.